If you need to escape Medellin's hustle and bustle, Guatape is a perfect place where to go for at least one day trip. Colombia's most colorful town is an only short bus ride from Medellin and the combination of zocalo-decorated town and nearby Piedra del Penol, a huge monolith overlooking a flooded dam, is worth a visit. Guatape, a small tranquil town in Antioquia department draw visitors' attention for many reasons. In the first place, its proximity to Medellin makes it a perfect destination for one day trip (although you can for sure stay even longer. Find your accommodation in Guatape HERE), secondly, houses decorated with zocalo are incredibly colorful (even in Colombian context when we have visited numerous villages with beautiful facades) and last but not least the town's settings in rolling green hills is just stunning. Guatape is exactly that kind of place, where you can wander its streets with camera in hand, sit in coffee shops and in short do nothing much but after the whole day, you will have a feeling of a nicely spend day. No one exactly knows why and when local people in Guatape started to embellish their houses with zocalos. Zocalo (the coat of cement) is differently colored lower part of a house, usually up to 80 cm high and this custom was probably imported to Colombia from Spain and the original main reason to use zocalo was house protection from erosion. People of Guatape took zocalo to a new and better level when they decorated their houses with colorful symbols and paintings which very often depict their occupation, their believes or history of the family, or of the house. When you wander around the streets, you can see, that everyone takes decorating of their house very seriously, all buildings look well-taken care of, and we believe that there must be an unspoken rivalry among residents of Guatape whose house is the most beautiful. Apart from colorful houses, there is the main square Parque Guatape with the town's church and another small square La Plazoleta De Los Zocalos which is known for its beautifully painted steps and busy restaurants, coffee houses, and shops. 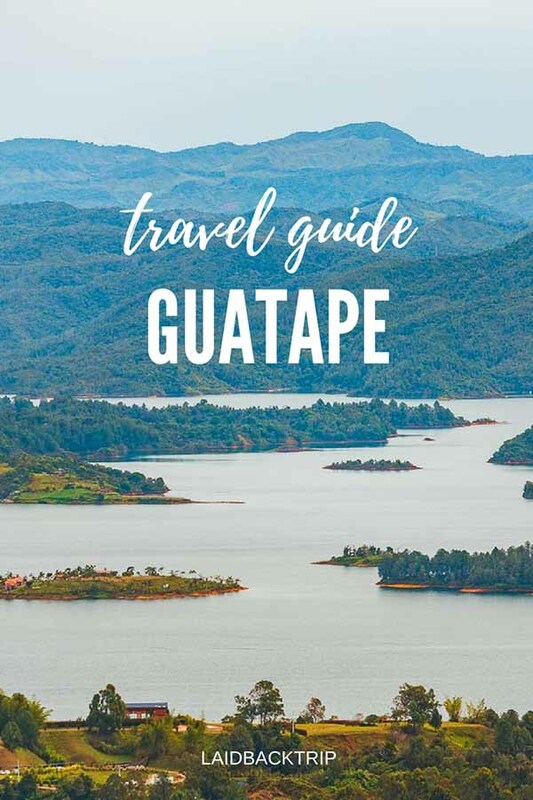 When we think of Guatape in retrospect, and after visiting many other small towns in Colombia, we found it a little bit more touristy than we would've appreciated. Because of its proximity to Medellin, there is, of course, a large number of travel companies who offer one day tour. The price is very reasonable, tours with lunch and boat tour cost around COP 79 000 (without entrance fee to Piedra del Penol) and at the beginning, we were considering it as well and almost made a reservation, but at the last minute, we found out that we would have traveled with another at least 40 people, and it was not exactly what we wanted. But if you are looking for a care-free way how to visit Guatape and Piedra del Penol, it is definitely an option. From Medellin, it couldn't be easier to get to Guatape. Buses go from Terminal Norte, to get here, use metro and get off at Caribe station. On the ground level, find company Sotrasanvicente. The bus goes every half an hour or so, so don't worry you will have to wait long. It is short, nearly two hours drive and the ticket cost COP 14 000. Our Travel Tip: If you want to get back to Medellin on the same day, buy your return ticket right after you arrive in Guatape. We tried to buy our ticket already in Medellin, but for some reason, it is not possible. There are many buses between Medellin and Guatape, and we don't think you would get stuck in the town, however especially on weekends, it could happen that the time you would prefer to go back might not be available. Approximately ten minutes before Guatape is towering an enormous monolith, The Big Guatape Rock, one of the largest in the world. You must climb either 659 steps from the rock base to the viewing platform or 740 if you want to get the views from the house standing on the top (additional COP 2 000). Steps are marked after every 25 which someone can find helpful and someone discouraging. I felt the letter because I did not feel well that day and although the climb wasn't particularly hard, I had to push myself to get to the top, but still, we made it in about 15 minutes. The entrance fee is COP 18 000. We think it is a bit overpriced, but Colombians will tell you that you'll get the most beautiful view in the world. Although it is not the prettiest view we've ever seen, we must admit the surroundings is enjoyable enough when we consider the story behind its creation. The water reservoir you can see beneath is man-made because a dam built in the late 1970s was flooded as a part of the big hydro-electricity project. Also a small town El Penol you can see below is the new town, the old one had to give way to a new project and now lies almost completely under water. If you arrive from Medellin, we advise you to get off at Piedra del Penol first. Just tell your destination at the counter, and later the driver will drop you off there (most likely you won't be the only one who goes to Guatape Rock). In that case, the ticket from Medellin cost a little bit less, COP 13 000. After you climb up the rock and enjoy the views, you can carry on to Guatape. Go back to a small parking lot where the bus dropped you off before and take a tuk tuk to Guatape. There are many drivers waiting and the ride costs COP 5 000 per person.